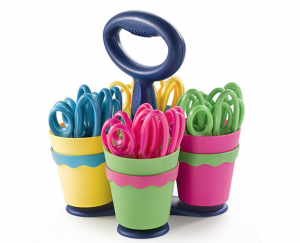 Westcott 5″ School Scissor Caddy 24-Count just $19.36! Head over to Amazon and snag the Westcott 5″ School Scissor Caddy 24-Count for just $19.36! That is just $0.80 per pair plus, you get the caddy to keep them organized! Such an awesome supply to donate to your kids classrooms. Keep in mind, Amazon pricing can change at any time! Don’t wait to purchase this deal or it might be gone when you come back! This item will ship free for all Amazon Prime members. Or, regular members can score free shipping by adding $25 or more worth of eligible items to your cart. You can get a 30-day free trial of Amazon Prime here. Subscribe to our daily savings newsletter and get hot deals, interesting stuff, and updates to your email inbox. Copyright © 2016 PinchingYourPennies.com. All Rights Reserved.